From the West: Take I-94 eastbound to 5th street exit. Follow 5th street. Take a right onto Robert Street. Turn west (right) onto Plato Blvd. From the East: Take I-94 westbound to 6th street exit. Follow 6th street. Take a left onto Robert Street. Turn west (right) onto Plato Blvd. From the North: Take 35E southbound to the Hwy 13 exit. Go east on Hwy 13, take a quick right onto Lilydale Road. Follow Lilydale Road to the stop sign on Plato Blvd. Proceed straight into Harriet Island Regional Park. From the South: Take 35E northbound to the Hwy13 exit. Go east on Hwy 13, take a quick right onto Lilydale Road. Follow Lilydale Road to the stop sign at Plato Blvd. Proceed straight into Harriet Island Regional Park. 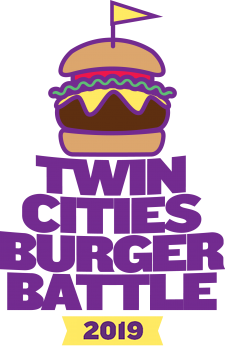 This year's battle will bring the Twin Cities' best local burger joints and restaurants to serve up burgers for attendees. The $60 all inclusive ticket will allow guests to enjoy unlimited beer and burgers from all participating local restaurants and breweries. Guests will enjoy live local music and cast their vote to crown the People’s Choice winner. A panel of judges will vote to crown the Twin Cities Burger Battle champion of 2019. Live musical performances and activities will run throughout the event. A portion of the proceeds are donated to The Sanneh Foundation.